Our entrepreneurship roots trace back to an eight-year-old boy and a wagon full of Coca-Cola bottles, when Truett Cathy started his first business selling soda for a profit to his neighbors. That entrepreneurial spirit led Cathy to open his first restaurant, the Dwarf Grill, in 1946, where he personally served and cared for his customers and neighbors six days a week. Two decades later, with experience to guide him, Cathy expanded his restaurant business to what would become his legacy: Chick-fil-A. But expansion required Cathy to find partners who would care about customers and the local community as much as he did. From that desire, the Chick-fil-A franchise business model – one that duplicated Cathy’s ethos and vision in communities across the country – was born. Today Chick-fil-A’s 1,600-plus restaurant Operators are the backbone of Chick-fil-A’s franchise model. Our Operators are not passive investors; rather, they are local business owners who invest time and energy in their businesses, engage with their team members, and connect with their customers. They are independent Owner/Operators who lead their businesses on a day-to-day basis – from hiring and developing team members, to running daily operations, to marketing and growing their businesses. In fact, more than 80 percent operate only one Chick-fil-A restaurant location. The initial franchise fee paid to become a Chick-fil-A Operator is $10,000 – in contrast to typical franchise fees that may climb to hundreds of thousands of dollars. But our Operators invest much more than money. Chick-fil-A Operators and their families become integrated in their local communities. They care for their team members. Some were once team members themselves. Others seek out ways to share kindness. And because each restaurant is independently operated, Chick-fil-A Operators decide where, when, to whom and how they give back outside of their restaurants as well. And give they do. Our model combines business opportunity and community impact: it’s a franchise opportunity that helps enable men and women to realize their dream of owning their own business, as well as an experience that affords Chick-fil-A Operators the opportunity to impact countless lives – from their team members to their guests who visit their restaurants every day. We are always looking for those who are strong leaders with proven track records in business leadership, results-oriented self-starters and are willing to devote their best personal efforts toward starting and growing a business while giving back to their communities. 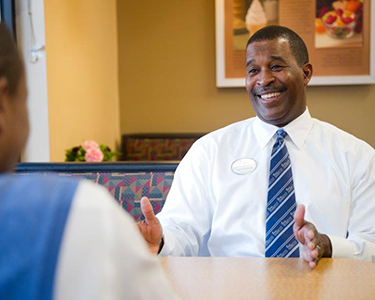 For more information on what Chick-fil-A looks for in its Operators, read more about franchise opportunities.